Pre-heat oven to 350-degrees. Melt butter in a two-quart baking dish in the oven. While it is melting, combine ¾ cup sugar, flour, baking powder and salt; add milk and vanilla, and stir until mixed. Pour batter over melted butter in baking dish, but do not stir. 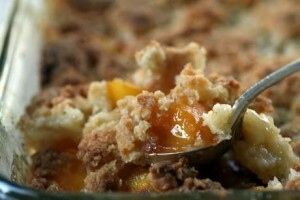 Combine peaches and remaining ½ cup sugar; spoon over batter. Do not stir. Sprinkle a cinnamon and sugar mixture on top, if you like. Bake at 350 degrees for one hour (60- minutes). Makes six-to-eight servings. This recipe can easily be doubled or tripled for use in larger baking pans. NOTE: Tastes best if made with fresh California peaches! But you can use fresh-frozen peaches. To freeze, take fresh peaches in-season, peel and slice, rinse in a “Fruit Fresh” bath or lemon juice bath to help preserve color. Drain, sprinkle with sugar, if you like, and place desired quantity in a freezer bag. Lay flat, and squeeze air out of bag and seal. Lay flat in the freezer. To use, simply defrost and eat immediately or use to make cobbler, pie, fruit smoothies, etc. Tastes great with ice cream! You can enjoy fresh peaches year-round!